Important map related to the Buache / Robert de Vaugondy Polar Debate! Carte Des Terres aux environs du Japon ou du Nord-Est de l'Asie et du Nord-Ouest de l'Amerique Extraite d'une Carte Japonnoise de l'univer apportee en Europe par Kaempfer et depose dans le Cabinet de feu Mr. Hans-Sloane President de la Societe Rle. de Londres. This is a rare and important 1758 map related to the Phillipe Buache / Robert de Vaugondy debate at the Paris Académie des Sciences over the cartographic configuration of the Pacific polar regions. This map was illustrated for publication with Buache's Considerations Geographiques. Cartographically Buache based this map on a Japanese map brought to Europe by the German traveler and physician Engelbert Kaempfer (1651 - 1716). Buache used the map to support his geographical theories regarding the Northwest Passage and Sea of the West. The Kaempfer-Sloane maps was brought to Europe in manuscript from Japan in 1695 by Engelbert Kaempfer, a German traveler and physician. The map was acquired by Hans Sloane after Kaempfer's death. Later it was sold at auction in London as part of the Sloane collection. The map illustrates Russian and Japanese knowledge of the North Atlantic. Today, it is seriously questioned by scholars who argue it is more likely a later compilation from European sources. At the time, it was important component in scholarly debates regarding the existence and location of the Northwest Passage. Buache's created a variant of the map, as above, which he published in his Considerations Geographiques to support his synthesis and reconciliation of the all available geographical information on the region. The Buache / Robert de Vaugondy debate at the Paris Académie des Sciences was one of the most hotly argued geographical debates of the 18th century. The debate centered around the existence of a 'Sea of the West,' the Northwest Passage, and the veracity of the Arctic explorations of Bartholomew de Fonte. In the 1750s, European knowledge of the Arctic and the Pacific Northwest was limited to the discoveries of Vitus Bering and Aleksei Ilyich Chirikov, the supposed voyage of de Fonte, and general geographical speculation. Buache was one of these speculators. Determined to win royal patronage, Buache leveraged the unpublished work (and fame) of his deceased brother-in-law, Guillaume De L'Isle, to create his own geographical theories, most of which blatantly pandered to the interests of the crown. The Buache system drew heavily on the unpublished De L'Isle 'sea of the west' maps, Russian discoveries, the De Fonte geography, and his own framework theory, which postulated a series of interconnected global mountain ranges, to argue for navigable northwest passage. Such a passage would have been a boon to French interests in North America as way to move valuable furs and other trade goods to the rich markets of China – trade routes then largely controlled by Spain. Buache fiercely defended his theories and in doing so came head to head with the meticulous and careful cartography of Didier Robert de Vaugondy. Vaugondy was a successful commercial cartographer and fellow member of theAcadémie des Sciences. His maps rejected the geographical theories, including the Sea of the West and the Northwest Passage, that Buache outlined in the Considerations Geographiques. Vaugondy also denounced the De Fonte voyages as unsubstantiated and doubtful, thereby deeply undermine Buache's theories and patronage ambitions. The debate came to a head in a series of papers published before Académie by both individuals, wherein historical references, geographical theories, and outright speculation were used to advocate for their own hypotheses as well as denounced one another. There was no clear victor at the time, although Buache did emerge from the debate with greater political power and influence. Ironically, the expeditions of James Cook roughly 30 years later, would ultimately discredit Buache's theories entirely. 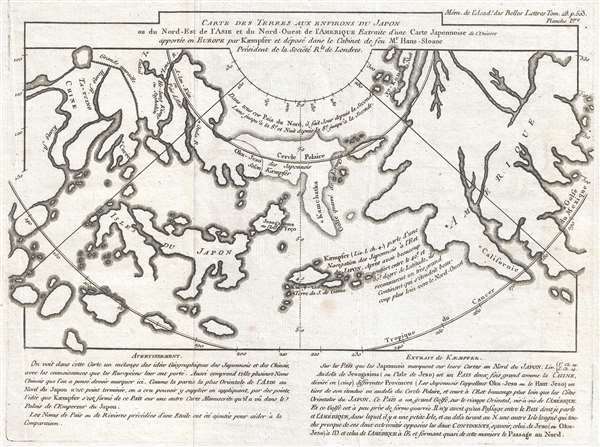 This map was issued as map VI in the Article CXV of the Mémoires pour l'Histoire des Sciences et des Beaux Arts, published by the Académie des Sciences in November 1758. The work constitutes the presentation of Philippe Buache on the topic of the mapping the Northwest Coast of America, Northeast Coast of Asia and contiguous polar regions, as part of the greater search for a Northwest Passage. It was later republished by Robert de Vaugondy for a supplement to Denis Diderot's Encyclopédie, detailing the Buache/Vaugondy debate. Today this map, as all maps from the Considerations Geographiques, is quite rare.